Year of the Labbit: Fridge Raid! Theodore warned Clover that Captain Holly would be a bad influence, but you know young labbit does. They always like the bad buck. 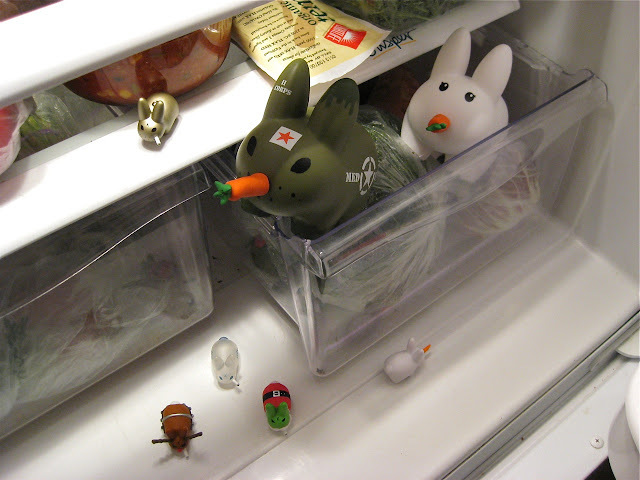 So it's no surprise that Clover went along with Captain Holly and his owsla as they raided the fridge for flayrah. They better not get caught! At least Holly's owsla is on the lookout. Most of them, anyway. Owsla: A group of strong rabbits second year or older surrounding the chief rabbit. flayrah: Unusually good food, such as lettuce, carrots, etc.